The AGENT++ C++ framework provides a complete tri-lingual SNMP v1/2c/3 protocol engine and dispatcher for the development of SNMP agents. AGENT++ facilitates the development of scalar and tabular MIB object implementations, particularly in conjunction with the AgenPro code generator. 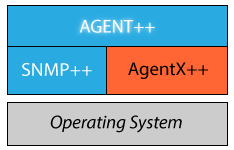 AGENT++ supports Linux, Solaris, HPUX, AIX, and Windows XP, 7, and 8 (VS 2010-2015) and requires SNMP++ version 3.x or higher. Because AGENT++ is ANSI C++ compliant, it may be used with other platforms and many embedded OS as well. A list of the RFCs (and MIBs) implemented by SNMP++ and AGENT++ can be found here. It can be configured at compile time whether to support SNMPv3 features or not. By disabling SNMPv3 support the View Access Model and the User based Security Model are also disabled! In this case AGENT++ only supports one read and one write community providing no security at all. However, there might be a situation where security is not needed, but the performance and resources gained from disabling SNMPv3 are more valuable. For any regular use, it is highly recommended to activate and use the SNMPv3 support.